Glass is our medium and is used to create sun-catchers, decorative panels, vases, decorative mirrors, lampshades, boxes, garden ornaments - as well as windows and cupboard doors. 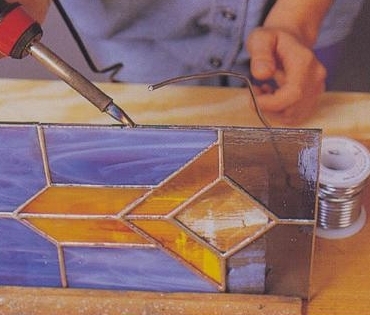 Membership in the Stained Glass Crafters Guild gives you access to specialized equipment such as grinders, diamond band saw, and the Morton Glass Cutting system. There is also a library of patterns covering a variety of projects - and a limited supply of materials. Guild members must also be members of the Credit Valley Artisans. Membership allows them access to the Cottage and also to participate in our annual sale. inspire each other in the completion of individual projects. We also participate in a group project that becomes a prize in the annual CVA raffle.